We no longer produce parts, but you can! We used to produce these, but due to tome constraints and unrealistic shipping costs from our country home in Canada, we no longer produce any parts. Any basic machine shop with a lathe can make any of the parts shown here, so feel free to print out the drawings have have these made. If you have a lathe and want to make these available for other AZ Forum Members for a fair price, feel free to contact us for a possible listing in our parts for sale thread. This Trike Axle FreeWheel Adapter (FDAX34) fits onto any 3/4 inch axle and allows the installation of a standard Shimano style thread-on freewheel and bicycle disc brake rotor. With this part, you can add a pedal transmission to any trike or quadcycle using only standard bicycle components. The locking bolt secures the part to the axle and allows for easy removal at a later time. The 6 disc rotor mounting holes are tapped so you can mount your bicycle disc brake rotor using standard M5 bolts. Right Click The Image to Save a Print Size Version. The Trike Axle Disc brake Adapter (DBAX34) fits onto any 3/4 inch axle and allows for the installation of a standard ISO standard 6 bolt bicycle disc brake rotor. With this part, you can add reliable disc brake stopping power to any trike or quadcycle using only standard bicycle components. The locking bolt secures the part to the axle and allows for easy removal at a later time. The 6 disc rotor mounting holes are also tapped so you can mount your bicycle disc brake rotor using standard M5 bolts. This heavy duty weld ready head tube shells make it easy for you to complete your bike or trike project. When you need several matching head tubes to complete a trike or quadcycle project, machined parts will save you time and effort since they are all identical and ready to be welded to your frame. These are designed with a slightly thicker wall so that they will not distort when being welded you your steel frame. The tubes fit the standard 1-1/8″ press fit headset hardware, so you can salvage any needed parts such as bearing cups and headset hardware components from other bicycles or purchase these components new from a bicycle shop. 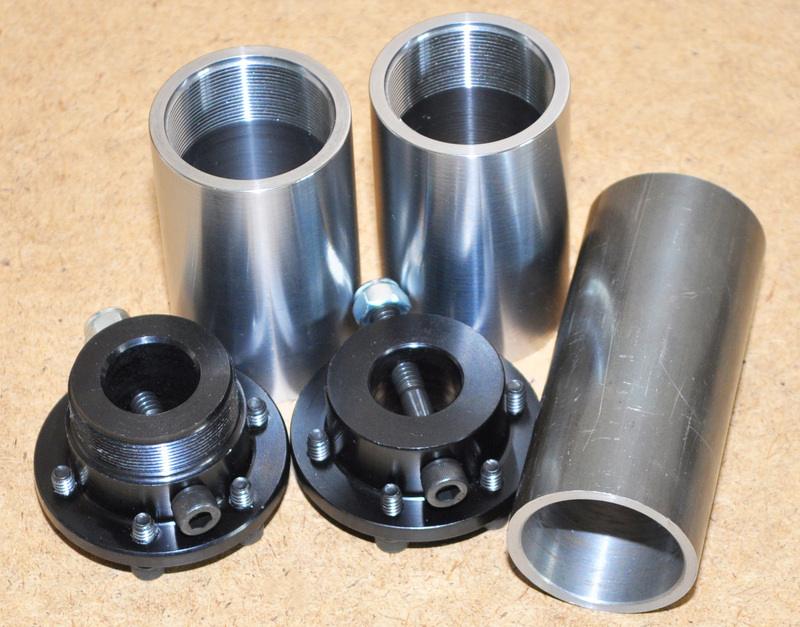 This heavy duty weld ready bottom bracket shells make it easy for you to complete your bike or trike project. You won't have to cut a bottom bracket from a donor frame and grind the shell clean, since machined parts are ready to be welded directly to your frame. These bottom bracket shells are designed with a slightly thicker wall so that they will hold their shape when being welded you your steel frame. The bracket fits any standard threaded 3-peice crank set hardware, so you can salvage any needed parts such as crank bearings and a crankset from other bicycles or purchase these components new from a bicycle shop. These laser or water jet cut ready Hub Flange Discs will make it easy for you to build your own delta trike wheels and save you time on your project. The Hub Flange Discs are made with 18 or 24 spoke holes so that you can build wheels directly onto any 3/4″ or 5/8″ axle using rims with 36 or 48 spokes. The Hub Flange Discs are made of steel and are approximately 1/8 inch thick as required by the plans. Spoke holes are 7/64″ in diameter so that standard bicycles spokes can be used. 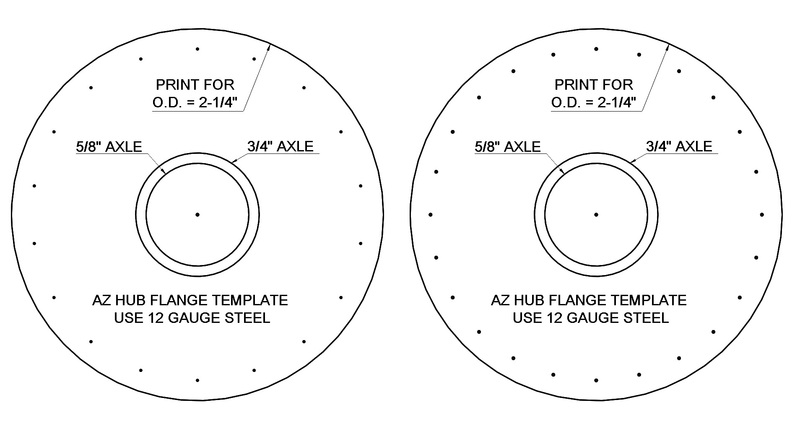 If you are making your own DIY Hub Flanges, these printable templates can be used as a punch guide for more accurate drilling. 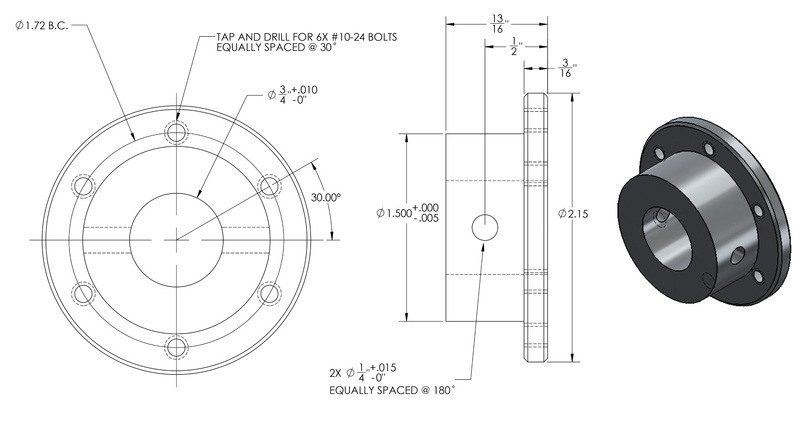 You will need to scale the image so that the outer diameter of the disc matches the requires 2-1/4″ dimension shown on the drawings.